I really, really love these. Magnums use great quality ice cream and chocolate, so even the plain ones are great. The honeycomb flavour is distinctive without being overpowering. Definitely a treat, but YUM! Streets Magnum ice creams are our ‘go to’ ice cream at our house. The Honeycomb crunch flavour is my children’s favourite. We love the creaminess of them and the chocolate coating is always a decent thickness, providing a fabulous texture against the smoothy creamy center. Streets Magnum honeycomb crunch is another amazing ice cream from Streets! I love the honeycomb flavour with the chocolate,a great combination of flavours! A treat to enjoy anytime! These are delicious if you like honeycomb flavour you should love these. Stays true to Magnums rich and creamy ice-cream cream and thick and delicious chocolate. This ice cream is delicious. It tastes more like caramel to me, and is coated in a yummy chocolate with little crunchy pieces of honey comb. A family favourite in my household! A very nice ice cream. The honeycomb was delicious and creamy. I wasn’t a fan of the crunch in the chocolate covering. I prefer smooth chocolate on the outside. The crunchy creamy melt in your mouth chocolate around the dreamy creamy soft smooth ice cream flavored a sweet lovely honey comb. Its just heaven in your mouth. These are one of my favorites. I buy these as a special treat for myself and hide them from the kids otherwise they would disappear they are so good. This is delicious ! Love honeycomb, add this to your shopping list ladies ! We all enjoy these on warm nights after dinner. Take them too the swimming pool Kids Love them – we do too Great for picnics too ! I recently purchased Streets Magnum’s honeycomb crunch ice cream and enjoyed the flavour very much, but I prefer plainer tastes, so I probably would not buy this flavour again. I loved this flavour but I do love very sweet desserts and honeycombe is one of my most favourite flavours. My hubby doesn’t like it though. These icecreams are very very sweet. Watch for the huge sugar ruch. The honeycomb is soft but far too sweet. Even the delicious magnum chocolate does not offset the sweetness of this product. 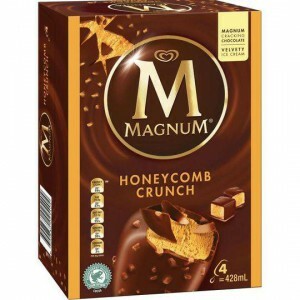 How would you rate Streets Magnum Ice Cream Honeycomb Crunch?